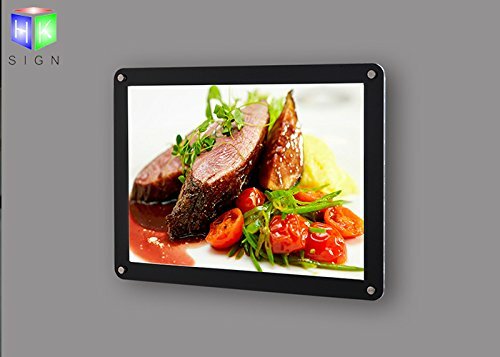 This ultra thin art led light box Powered by innovative LED technology, this thin lightbox offers bright, even lighting in our thinnest profile ever!. (1) the thickness only 6mm, the frame cover width 30mm. (2) this Itme A3 size frame size is 460mmX337mm, art work poster size is international A3 size-420mmX297mm, (3) the front cover use the import transparent acrylic panel to protect the artwork from damage when display. and make the artwork display more beautiful. (4) the LGP use the import acrylic material, then use the 3D laser engraving machine production the LGP , it is more brightness and light effect is very uniform. (5) the price is include the buyer country local plug with DC 12V power adaptor, can use for AC100-240V. so it suitable global country, and very safety. (6)our company is professional manufacturing led sign have more than 10 years , it is directly sales from our factory , so competitive price with high quality . (8). every year, our company has attend the international sign fair in Florida or Las Vegas in United States of America. so we are more pay attention the quality when production. If you have any questions about this product by Haokang Sign, contact us by completing and submitting the form below. If you are looking for a specif part number, please include it with your message.